I didn’t just meet some of the Steampunk crowd but I also met and chatted with a bunch of random people. It was pretty awesome despite the deluge. There were enough shelter spots and while they officially canceled the joust, it still happened. The guys riding were amazing! The crowd was rowdy, which was to be expected. The Steampunk group was supposed to be sitting with the Queen during the joust but I think it was raining too hard for her Excellency to sit, even under a tent, to watch it. And, yes, I made this costume specifically to sit with the Queen during the joust. I did need a real bodice so it’s all good. I took a modern day umbrella and used it off and on while I was there ALL DAY. I seriously stayed from pretty much opening to close. It’s a small faire but there were great performers and a some sweet merch. My feet got cold so I bought some wool blend knee high socks. Once I had those, I didn’t really feel the cold. Most of the time, I wore my Go To Patterns Cape. I interlined it with cotton flannel and lined it in poly charmeuse. The outer layer is a wool suiting and the whole thing was perfect for the chilly day I put myself in. The hat I bought last minute at a Halloween store. I love it. 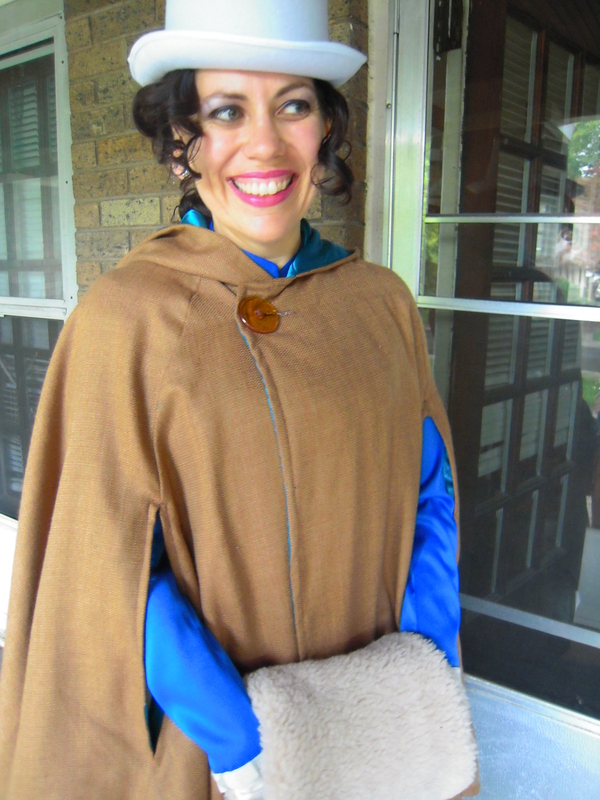 For the underskirt (the blue one) I used a skirt pattern I’ve used several times from Fashions of the Gilded Age: Vol. 2. The bodice came from Truly Victorian- the Cuirass Bodice TV 460. 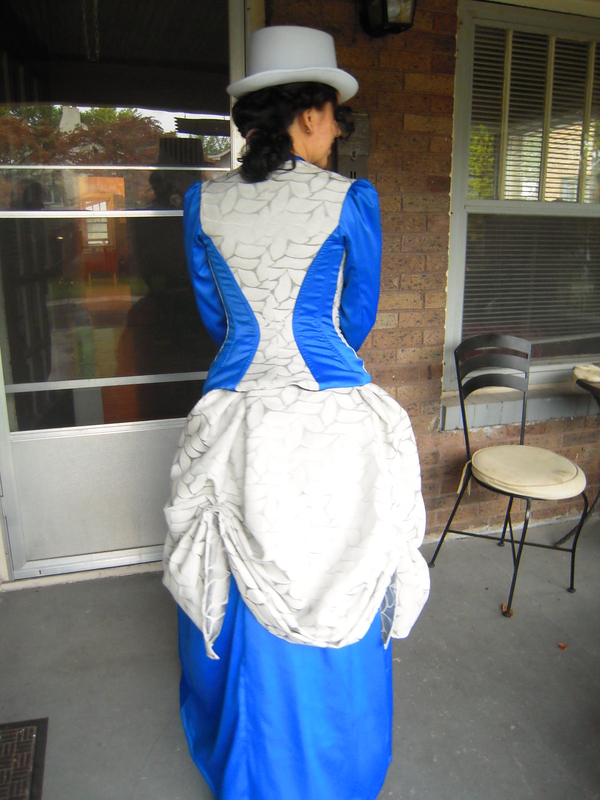 I used this pattern before to make my Victorian ballgown last winter. It’s a great pattern that has lines for a day bodice as well as an evening bodice. I’m using the same day bodice pattern right now and altering it to make my tweeds for the 19th of the month. Overskirt and apron were both draped and stitched to grossgrain and tied at my waist. There are patterns for these two pieces but I just played around until I got what I liked. Both of these were made with this brocade I got from Fabric Mart that has a leaf motif and metallic threads throughout. The blue fabric is a sateen with a bit of stretch I bought wanting to make pants but I changed my mind. 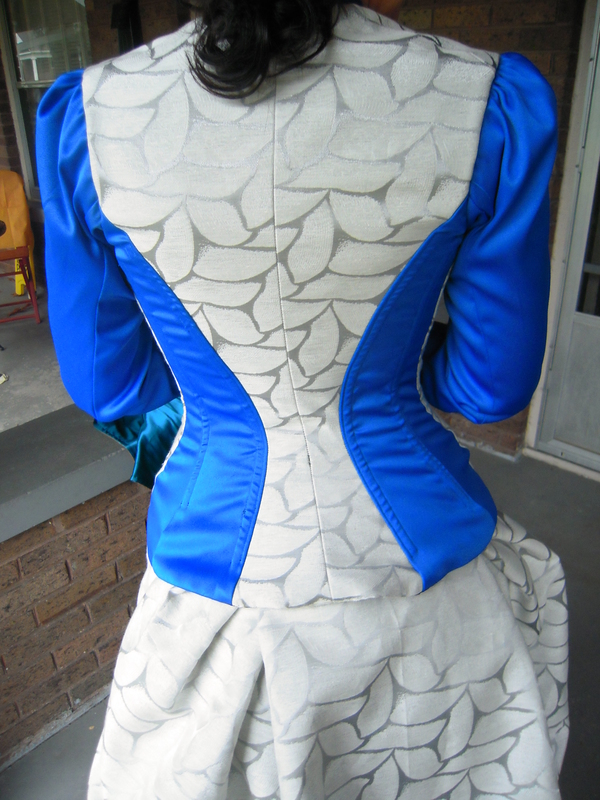 For the next day bodice I make, I need to alter the high bust/back of the neck area. You can see if you look closely in some of the pictures that the fit isn’t quite right. I didn’t notice this until I was all done- or perhaps I didn’t want to notice. Who knows. Brooke was helping me with this. If any of you get the same drag lines from the back of the neck to the front of the shoulder, let me know, and tell me what you’ve done to eliminate the drag lines. Other than those drag lines, I’m super content with my costume. The skirts are super quick to whip up now that I’ve had all my undergarments done up for a while. Cool thing is that I can wear this costume for any day events and it’s ready to go. I might add a little ruffled collar but that would be it. I’m washing the whole costume because it got so super muddy. The undergarments are stained at the hem but clean. In other words, they’re more authentic now. Anyone making costumes? What about for Halloween? Or do you buy your Halloween costumes? I know there are some things I just don’t ever feel like sewing. No shame in that. Wow! I love your costume and the hat finishes it perfectly (but then I love top hats!). Sounds like an amazing day! I couldn’t agree more about the hat! I lucked out on that one. The hat is killing me, I love it so much. Omg, mud man? Wow. I wish someone had been a mud man yesterday. That would’ve been so cool. That is so COOL and also you look absolutely beautiful. You look super pretty. This came out really well.Oh what a shame you did not get to sit with the Queen, perhaps another time. I kind of stop doing Halloween in SD, there is a lot of not really dressed going on. Thanks! It feels good to be doing costumes again. I love it! One of these I will go to the Fishers Ren Faire. You should come out to the Ohio Ren Fest when we go! This looks great! I love the colours (although I can only imagine how that white took to the mud). I’m slowly, slowly building up to a Victorian costume, I’ll let you know if I have similar bodice issues—I have another TV bodice pattern. It didn’t do too bad in the mud, luckily. My petticoat now just looks more period accurate but the mud washed out of everything else. Thanks Brooke. The hat, the thing that cost the least and took no time to find, I love so so much. 🙂 thanks for taking a look for the alteration. I’ll add at the neck. Yeah, it’s not super noticeable. What a fabulous costume. You look gorgeous in it. Now you just need a part in a movie :). Thanks! It was sooo fun to hang out with new friends in costume. I love your costume! The cape goes with it so well. I usually make Halloween costumes for the family, but I think I’m just going to buy them or make them reuse previous years’ costumes this time. I just am not up to it. I just bought the boy a costume. I don’t need the pressure. Yeah. Take it easy. Your body needs to rest. this is stunning. I want to borrow and enter at Dickens Festival Victorian dress competition here.. I’m sure it would win! Thank you! I love the pattern pieces. Love this period.